The Education Foundation of Collier County, Inc. is doing business as (DBA) Champions For Learning™. You will find financial and other information under the legal name The Education Foundation of Collier County, Inc. Champions For Learning has an official representative registered with Charity Navigator. 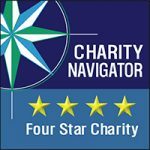 The organization has been awarded, the highest four star rating for sound fiscal management and commitment to accountability and transparency by Charity Navigator. Have any questions about our financials? Let's talk about it!